The LittleCMDB is a Workflow-driven Database Application which stores information of Virtual Machine configurations in a SQL database. The user can see the configuration via a web-based UI. It’s even possible to file a Request to change the configuration of a VM via the Web-Frontend, it will automatically processed and the settings of the VM will be adjusted. 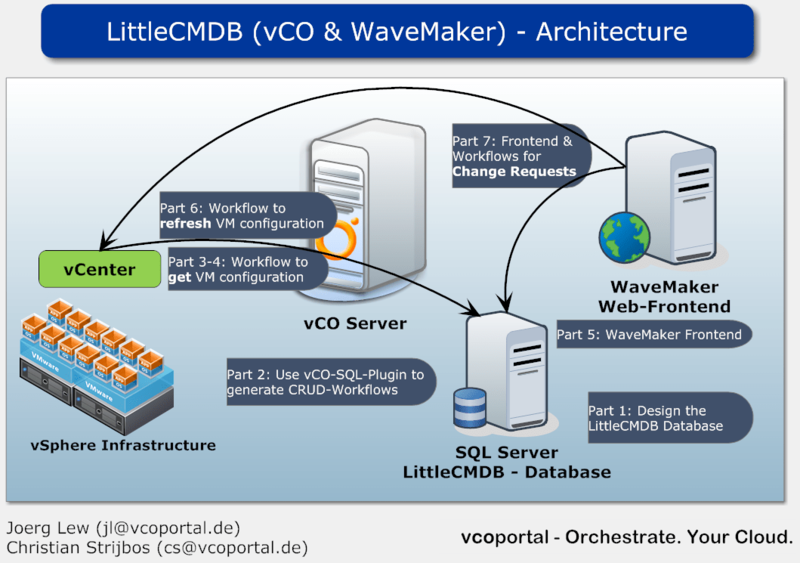 LittleCMDB uses Orchestrator Workflows to implement the “business logic” of the application. For that it leverages the SQL-Plugin for vCO, so you don’t have to write a single line of SQL Statements. There will be some backend Workflows which gather information from vCenter and store them into the Database. The web-based frontend is built with VMware WaveMaker. We will publish a full guide how-to build the LittleCMDB from scratch, separated in different parts over the next couple of days (see the picture above also as a “Table of Content”). We will also provide the Workflow Packages and the WaveMaker project to download. So: Even if the downloadable workflows should run quite out-of-the-box, do NOT use them for production! The complete project is for educational purposes only. …tomorrow in this Theater :mrgreen:!